You can order Cody's latest CD now. It was released 4-8-08. $18.00 + $1.70 shipping and handling in the U.S.
For other countries, please use email button below. You can Use PayPal for fast delivery, or use the e-mail button at the bottom of this page to pay by check. For checks, please allow 2 weeks. Many Roads Traveled is an incredible musical journey featuring many Grammy-winning artists and musicians such as Bruce Hornsby, Ricky Skaggs, Alison Krauss, Jerry Douglas, Darin Vincent & Jamie Daily, Andy Leftwhich, Barry Bales, Stuart Duncan, Adam Steffey, Rhonda Vincent, Sally Jones, Sharon White & Cheryl White, Byron House, Mark Fain, plus more. 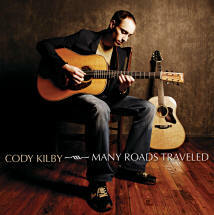 CD featuring Cody, Tim Stafford, Bryan Sutton and 20 other famous pickers. This is live from the national flat-picking champion ship at Winfield. please e-mail Cody for payment instructions. Include the names or titles of the items you need along with quantity of each. Please add $1.70 for shipping on each order.